Welcome to the Parish of Saint Michael the Archangel! 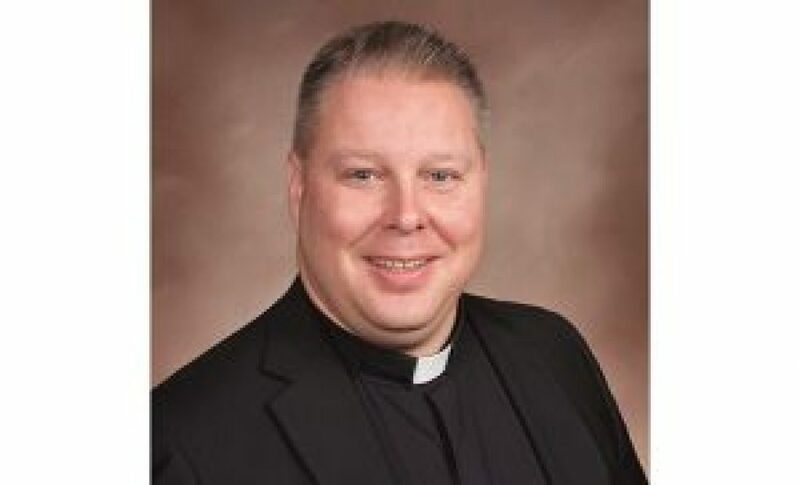 We are located in the Diocese of Camden, New Jersey under the leadership of the Most Reverend Dennis J. Sullivan. The Parish serves the communities of Franklinville and Clayton. Rev Lawrence E. Polansky is our Pastor. 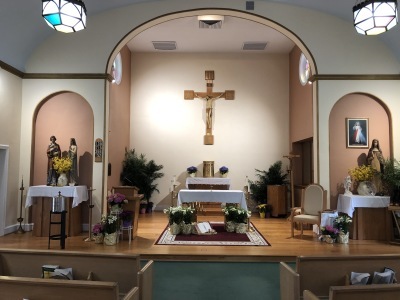 The Parish of Saint Michael the Archangel was established September 29, 2010 through the merger of the Church of the Nativity, located at 2677 Delsea Dr, Franklinville, and Saint Catherine of Siena Church, located at 700 N Delsea Dr, Clayton. The Parish Office is located at 49 W North St, Clayton. 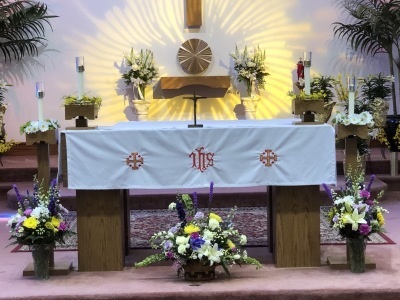 We invite you to visit the pages of our Parish Site to learn about who we are as a community of faith and the services our parish provides. 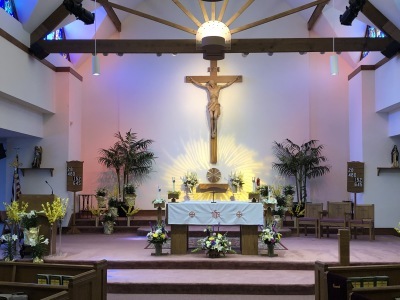 If you are thinking about moving into our area, we cordially invite you to make the Parish of Saint Michael the Archangel your parish home and join us in our mission. Christ is Risen! He is Risen Indeed! Alleluia! Alleluia! Seeing and believing in Jesus’ Resurrection is as much a challenge for us today as it was for the disciples who were eyewitnesses. The challenge really lies in seeing and believing that risen life comes through our own self-sacrificing love of others. When we do this, we, too, are eyewitnesses. 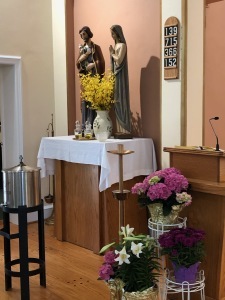 Even on this day when the Gospel announces the risen Lord, we feel the contradictions that the Resurrection mystery arouses – seeing and believing on one hand … misunderstanding and confusion on the other. This mystery defies all human understanding. These Easter stories tell us that the Resurrection isn’t something we understand, but rather something we believe and live. We might take our clue to entering into the mystery from the Second Reading from the First Letter of Saint Paul to the Corinthians. Lent has been the time when we cleared out the old yeast (of “malice and wickedness”) “so that we may become a fresh batch of dough.”Like Christ, our “Paschal Lamb who has been sacrificed,”we, too, must be willing to give ourselves up in the self-sacrifice “of sincerity and truth.”Inasmuch as we are the dough, we must be willing to allow others to feast on us. When Paul invites the Corinthians, “let us celebrate the feast,”it is truly a startling invitation. As Jesus gave His Body on the cross and gives His Body and Blood to us as nourishment, so must we do the same for others. The only way to open ourselves to the new life that God promises through the Resurrection of Jesus Christ is to open ourselves to the needs of others in self-giving. If we try to understandthis Resurrection mystery, we will miss it. The Scripture readings for today invite us to live the mystery by self-sacrifice. In this way, God gives us the new life that Jesus’ Resurrection offers. The Gospel identifies three (3) characters: Mary of Magdala, Peter, and the “disciple whom Jesus loved.” By not being named, John can function symbolically – today, all of us are the “disciple whom Jesus loved.” Instead of trying to understand, we simply “run” to the mystery and embrace it so that we, like John, can enter into it … see it … and believe it. In Saint John’s Gospel, seeing and believing aren’t mental exercises … but rather are actions that express one’s inner disposition. Our belief in the Resurrection is a matter of willingness to embrace self-sacrifice – allowing others to “feast” on us. Even on this Easter day when we rejoice in the risen life of Jesus, we are reminded that Resurrection has its cost – self-emptying for the sake of others. The paradox of Christianity is that dying to self isn’t something to avoid, but it is a way to remove the stone that blocks our own hearts from receiving new life. We have the next fifty (50) days of Easter to help us grasp in our hearts and daily living that when we reach out to others we are actually living Jesus’ risen life. We need only take the time to contemplate this mystery and recognize the good with which God blesses us. We need to see beyond the obvious – an empty tomb and the demands of self-emptying – to the glory that God has bestowed through Jesus Christ. 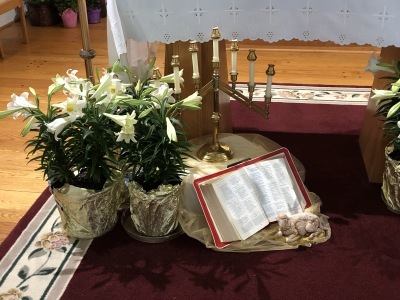 The alleluia that bursts forth with the news of Resurrection captures a heartfelt cry that we be willing to identify ourselves with the dying and rising Christ. I thank all who work so hard and are so generous in helping to strengthen our Christian faith community here at the Parish of Saint Michael the Archangel. Be assured of my daily prayers and Masses for all of you. 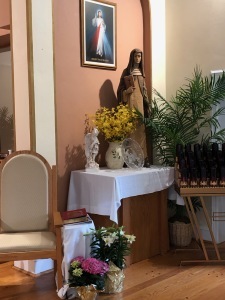 May I ask for a continued remembrance in your prayers and Masses as well? May Saint Michael the Archangel defend, guide, protect, and intercede for us always! Please check out the "Diocesan News"
to find out what's happening here in the Diocese of Camden! View pictures from our most recent bus trip to Lancaster, PA by clicking here.